All in one Solution MSG to Office 355 Converter Software is designed with advanced algorithm to Export MSG to Office 365. At the laboratory the MSG to Office 365 Software is tested by professionals before its launching on several aspects to make it faultless and trouble- free Software. MSG to Office 365 Conversion Software successfully Convert MSG to Office 365 with maintains every MSG folders structure. The technology behind the designing and development of MSG file is to basic feasible application by meeting the entire requirements of technical as well non- technical users. Maintains all folders, sub-folders, emails attachments and properties while convert MSG to Office 365. 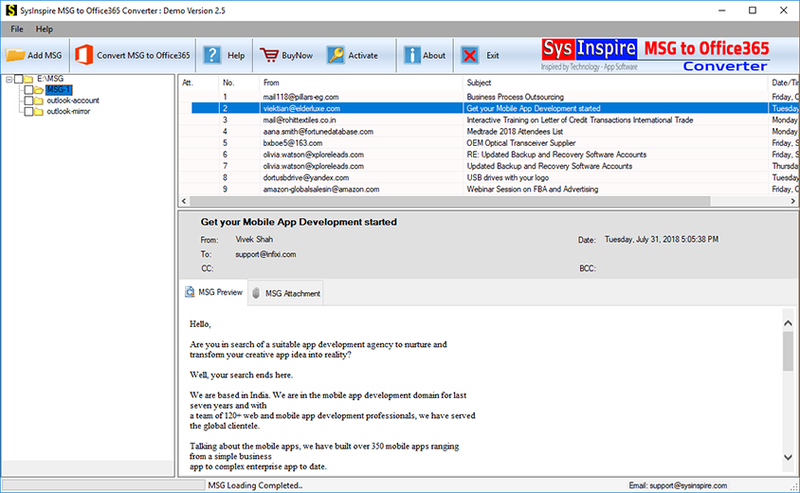 Not Outlook Installation & Supports MS Outlook versions included – 2016, 2013, 2010, 2007, 2003 and below versions. Easily Convert MSG Emails, Calendars, Contacts, Journals, Inbox items and other user’s mailboxes items. 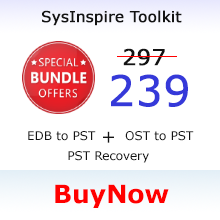 Free Demo version software which converts 25 items from each folder into every formats. 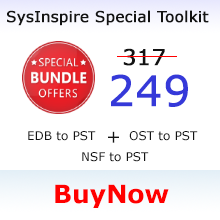 SysInspire MSG to Office 365 Converter Software is a program let users perform MSG to Office 365 Conversion. No matter whether the MSG file is corrupted, damaged and encrypted password protected the software will effortlessly take out all mailboxes folders items like- emails, calendars, contacts, task, notes and other users’ mailboxes and convert MSG to Office 365 with maintains data integrity. MSG to Office 365 Software is capable to convert selective mailboxes folders with each emails and attachments and import MSG to Office 365. 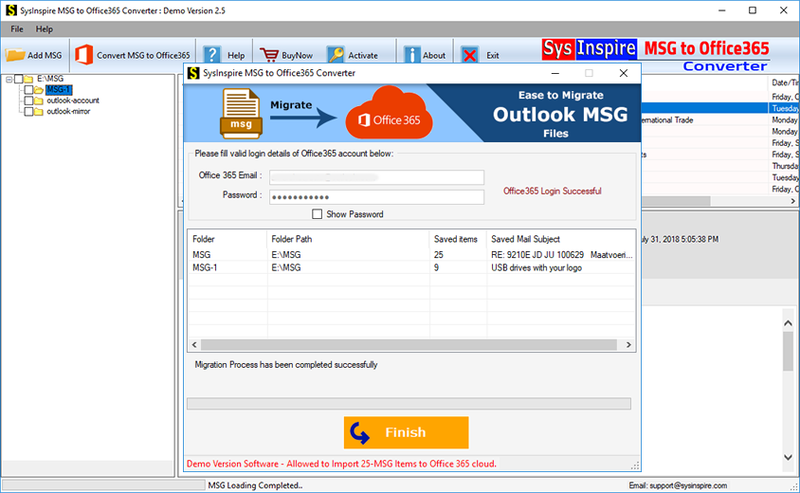 In case clients want to upload Outlook MSG files from a folder that having lots of MSG files, then this SysInspire MSG to Office 365 Converter Software supports batch conversion of Outlook MSG files to Office 365. The conversion of data in bulk guarantees to save the precious time during dealing with multiple MSG file conversion. So quickly use it and doing Export MSG to Office 365 in batch conversion procedure. 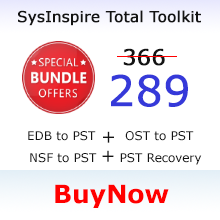 SysInspire MSG to Office 365 Software is made with latest technology and due to upgraded technology it supports every type of MSG file like- corrupted, damaged, inaccessible and encrypted password protected MSG file into Office 365 with extract MSG file emails, contacts, calendars, task, notes and other items. 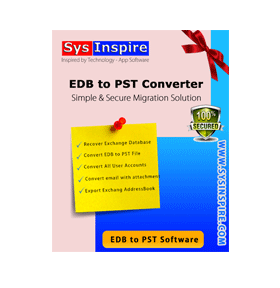 No file size limitation is required you can convert any larger MSG file with attachments. Astonishing MSG to Office 365 Converter Software is 100% safe, secure program that let users convert ANSI and Unicode MSG file to Office 365 with emails items and attachments items. 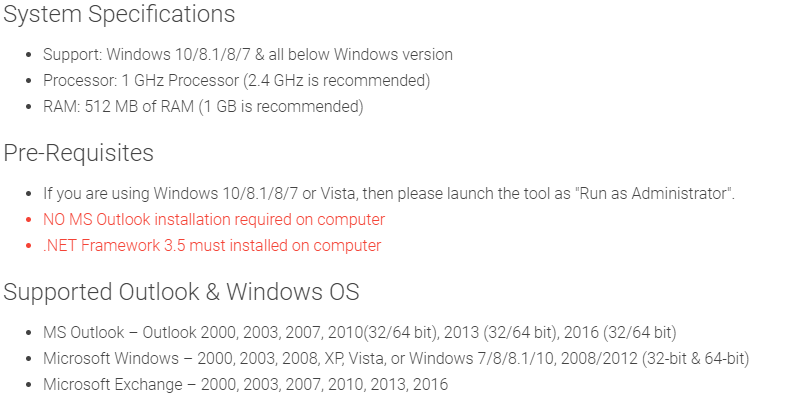 Software supports all MS Outlook versions included- 2016, 2013, 2010, and 2007 to below versions (32 and 64 Bit). MSG to Office 365 Software successfully works to Import MSG to Office 365 with preserve data truthfulness. This single exclusive MSG to Office 365 Converter Software completely Convert the contacts folders of MS Outlook MSG file and import data into Office 365. This is safe way for MSG to Office 365 Conversion and you can also convert only the contacts folders of MSG file (ANSI and Unicode) into Office 365 without losing any information. Number of contacts file from different folders you can convert only with this MSG to Office 365 Software. MSG to Office 365 Conversion Software facilitates users to convert the calendars folders of MSG file to Office 365. Multiple Calendars folders of MSG file can be converted in single conversion attempt with preserve all its records. Along with Calendars folders, the MSG to Office 365 Converter Software perform export MSG to Office 365 with emails, calendars, task, notes, inbox items, junk folders, meeting, appointments and other users mailboxes. 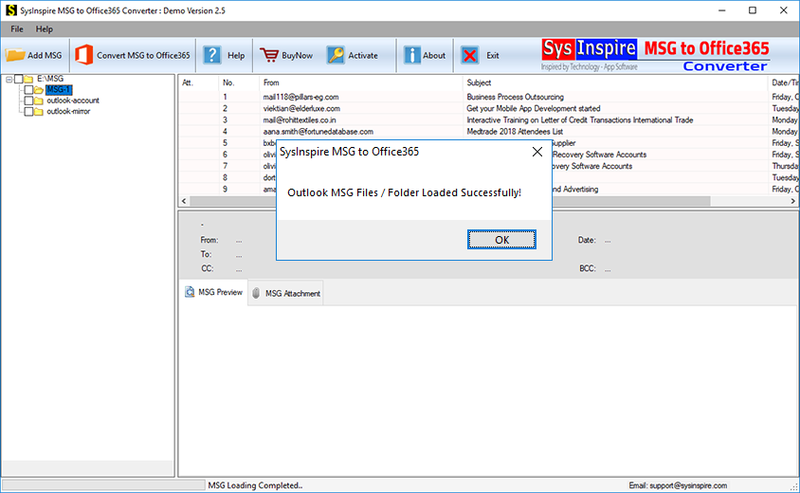 Does this MSG to Office 365 Converter Software support MSG Files of Outlook 2016 and 2013? How many MSG file can I import at a single time to Office 365 account? MSG to Office 365 Converter Software allows users to convert multiple MSG files/ folders to Office 365 in single conversion cycle. Can I convert corrupted MSG file to Office 365 using this MSG to Office 365 Software? 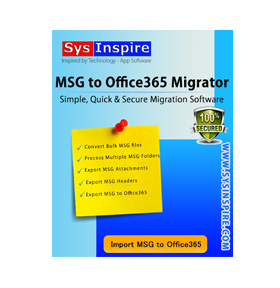 Do I need to install MS Outlook application to run the software to Import MSG to Office 365? No, there no need to install MS Outlook application on machine to export MSG to Office 365 because without outlook environment software can perform. Can I convert selective folders of MSG File to Office 365 with this Software? Yes, this MSG to Office 365 Converter Software allows users convert selective and complete folders of MSG files to Office 365.